This URL claims you have 24/7 tech support http://www.exede.com/customer-support/ I've tried calling 855-894-5665 as well as 855-493-9333 regardless the prompts I take your IVR mashes in a dozen or so digits to transfer the call and I get disconnected every single time. 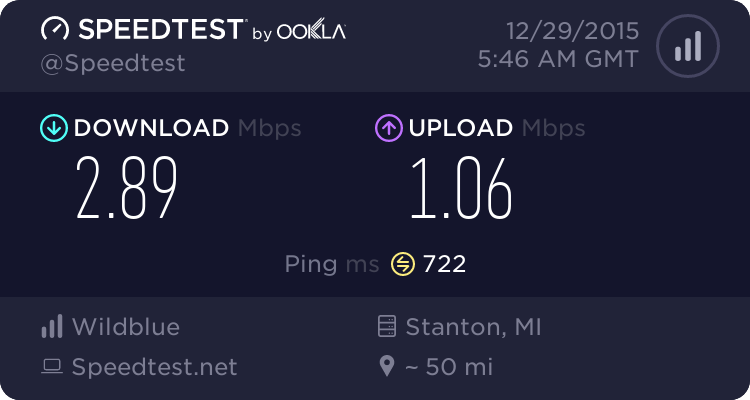 I'm on the Exede 25 plan paying $140/mo and I'm not terribly thrilled with the performance of my connection the past week or so. I am NOT capped and it shouldn't matter anyhow since these tests took place in the LNFZ and yes I've tried resetting the modem, routers, blah blah blah. Yes I'm aware of Liberty plans but I'm not on a Liberty plan. You can also try emailing exedelistens@viasat.com with the issues you are seeing. There are some areas where the bandwidth on Exede's satellite bands are saturated (especially during the holidays where many people spend more time at home) which causes slow speeds. It's also possible that you have an issue with your installation (e.g. your dish is out of alignment). Try calling the Exede Customer Service number (855-463-9333, I noticed the number you have is 493 vs 463) which can be found from https://www.exede.com/contact-us-exede/ . The hours of Customer Service are posted here, http://www.exede.com/customer-support/. If you were trying to reach Customer Care, they are not 24 hours. Hope that helps and good luck with getting your speeds back.